SAP SMP 3.0 On Premise SMP3.0 MBO Java virtual Machine setting. The SMP 3.0 ODATA server as well as the SMP 3.0 MBO server uses the Java Virtual Machine JVM. Far too often customer will run in to error JVM ran out of memory or the JVM is very slow and causes transaction to process slowly. Either over allocation or under allocation 99% of the time is the root cause. In this article I will outline some details for the starting point customer should consider when setting up the SMP servers. Recommend starting values for the Java Virtual Machine. Because no two environments are the same there is always variables there for in those cases the administrators would need to implement and test until they find the correct setting for their environment. SMP 3.0 MBO server runtime. SMP 3.0 On Premise ODATA. Thou the two SMP 3.0 servers are completely different from each other they each use a Java runtime environment. The do not share the JVM with each other as they have their own JVM pool. Issue: After running the SAP SMP 3.0 server for a few week the administrator is reporting the SMP server stops responding users are not able to register or sync there device. They are also are seeing the SMP server stopping and no longer up and running forcing the administrator to start the SMP 3.0 server. Again this can and does happen with either server type MBO or ODATA server. Cause: In most not all but most incidents this is caused by an incorrect configuration of the Java Virtual machine. Either the SMP server is using the default configuration values or the administrators’ unknowingly have over allocated the Min and Max JVM pool size. Analyzing the error: More often than not the JVM will throw an out of memory error, when in fact the JVM and the machine has plenty of memory. The question is why is the JVM throwing an out of memory when we set the Max to 24gig or 64gig it does not make any scene. In this scenario the Java Virtual machine is over allocated. What is happening is the garbage collector is responsible for reclaiming memory and it can’t NOT keep up because the memory segments to fill up once that happen it over loads the JVM allocation pool. You screen should look like this. NOTE: Be very care full when making changed to the user Options line if you make typo fix and don’t add spaces otherwise the SMP server will Not stay up running as it will not be able to create the JVM pool needed. Each time you change the Java Virtual server you will need to save the values and restart the nodes. What would be the maximum values for a JVM I would recommend? We do see customer on the high end however once you get past the 12gig mark you could start running in the JVM garbage collector error for running out of memory so customer really would need to test to see how a high values would impact thee overall system. When adjusting the JVM memory you also need to consider the total amount of memory that the operating system has. 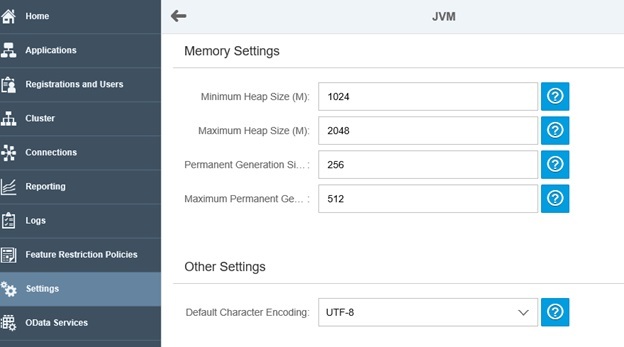 SMP 3.0 On premise ODATA server JVM settings. Login to the SAP Managed cockpit and o to the Java setting. Login to the SAP Managed cockpit and og to the Java setting. Note once changed the SMP nodes will need to be restarted in order for the changes to take place. First shut down the secondary nodes, once all the secondary nodes are shut down then shut down the primary node. For the SMP 3.0 on premise ODATA servers even thou they are in a cluster they do not have the concept of primary or secondary status. In this case you can update any one of the nodes. Once the node is updated the update will be sent to the other SMP 3.0 ODATA server in the cluster this is automatic. Once all the nodes have the JVM change then you will need to stop and start each node in any order for the update to be implemented. Performance and tuning is always a challenge to IT and administrator. With this write we can only hope to have a good starting point. It is very important to understand the impact of allocation of resource for any application and how that impacts the overall performance with the combination and adjustment for the JVM should help the SMP 3.0 ODATA on premise and SMP 3.0 MBO server work more efficient.